Rilakkuma and Kiiroitori Field Trip Bento, originally uploaded by sherimiya ♥. Can you guess what day it is? That's right: field trip! They're going to visit a working farm with tractors and everything. I packed another recycled strawberry tub for him, with the standard field trip fare -- sandwich, veggies and fruits. But this burger is even more awesome than yesterday's. I used the same burger mix and stuffed today's burger with cheese and salami, then pan-fried. The cheese oozed out the side and got all crispy and golden around the edge of the burger, and the parts of the salami that stuck out got crispy-fried too. Yum. And remember, he still gets the carrot and broccoli bits in the turkey burger too. Super score. I lay some dandelion greens in the whole wheat bun and placed the patty on top. I found these little buns and thought they would make a cute Rilakkuma. I used Susan's idea for raisin eyes and nose (but I later pb'd them on), and added a radish muzzle and nori mouth. His ears are salami rounds. And Kiiroitori is there too, to make sure he doesn't fall asleep. I dyed a hard-boiled quail egg with golden beet juice, and it turned a super dark shade of yellow. I love it, especially since it's totally natural! Facial details and feet are nori and carrot. I used grass baran to keep the fruit and veggies separate from the bread. Along with carrot sticks and romanesco, I tossed in a bunch of strawberry cherries, a half plum and a homegrown apricot. Love this one! Such a cute bear! I love it! I'm going to start collecting them containers too - get at least another use out of it rather than just binning it. So wonderful, and yes, that burger sounds like the ultimate in flavorful yumness...combined with off-the-charts cuteness, this is just amazing, Sheri! 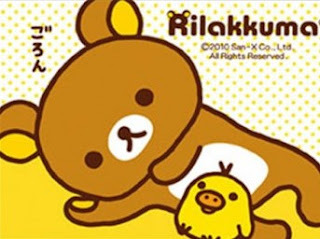 You got the serious/adorable Rilakkuma and Kiiroitori expressions spot on!! Wait! This is for your kid?! He eats all these amazing fruits and veggies?? Oh wow. I love the salami+cheese add on! So delish. Totally cute bear and little chick, I don't think I've ever seen them before! You do quail egg characters like no other Sheri! Too cute! I thought the Kiiroitori was a little toy because it's made so perfectly! How did you get the nori to stay in place? Awesome bento and blog! Thanks Sonoma Bento! Recycled bento box ftw! mils, you can also use curry or turmeric, but I think golden beet is the most intense. And it only takes a short time (few minutes). Really amazing. Hope you can find it! Thanks a lot! Thanks so much Jenn, for your kind comments! Chantale, well, mainly fruits and not much veggies in this one, heh. He got the rest in the burger, right? Thanks a lot! yt_lee10 -- I used peanut butter to make the raisins stay in place, but the nori will stick easily to a moist radish or egg. So sweet of you, thanks for reading! Oops, didn't see your comment KidsDreamWork! Yes, I think the strawberry containers are just the right size for a sandwich and side fruits! Very handy and disposable! so yummy and cute!! too cute to eat?! Recycling berry boxes for field trip lunches is BRILLIANT!! 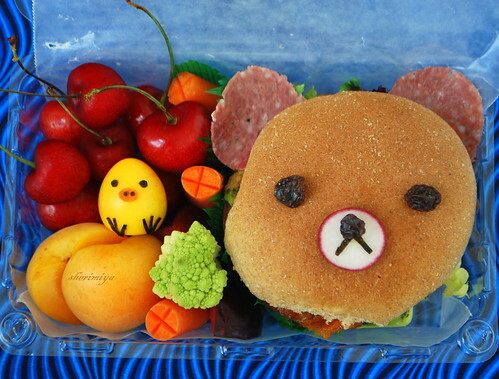 The bear burger is not only cute, but sounds delicious. The quail egg is awesome. I love that you colored it naturally! Thanks a lot Melissa, for your sweet comment. I'm always pleased when I can go greener with bento, and recycled disposables and natural food colorings are my happiest achievements! Hi megan! So nice to see you again! Thanks Mikka- you should totally make it. So fun! !